Make Children’s Dental Health Fun for Your Kids! Helping your child learn to love taking care of their teeth is going to play a huge part in their adult smile’s and health. As their parent, you have a huge influence on how they take care of themselves now and in the future. You can help make dental care more important to them when you implement a few tips from this list! Let your child watch educational TV shows – You can find thousands of videos on YouTube or even educational DVDs that encourage better oral hygiene habits. Create a chart for encouragement – A dental chart is one of the best ways to show them what steps they need to take to fully complete their whole routine. Use star stickers or another way to track their progress. Lead by example – Your little ones look up to you! Be sure to care for your teeth with them by your side so that you encourage great hygiene habits. Teach them the best way to brush their teeth – Your children could be brushing and flossing, but if they don’t do it right, then they could still be susceptible to dental diseases. 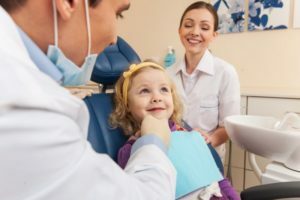 One of the best ways to prevent dental problems like tooth decay and cavities is to have your child visit a pediatric dentist when they are young. Your little one should be visiting the dentist to have a professional’s opinion on their smiles’ development and deep dental cleanings. Plus, if there are any problems, your dentist will be able to help them make improvements with exceptional dental care. Here at Wehrkamp Dentistry, we know that a healthy smile helps to keep the whole body healthy—and it starts early on! You can depend on your dentist to provide great dental care for your whole family! Call our local office today to schedule a visit for you and your little ones sooner than later.